Whew! I am writing this post while sorting through songs to play wedding day… and finding all the photos of things I didn’t blog about. (Shame on me!) But I have reasons! Some of them are better than others too! One of my reasons is we have been redecorating some of the house by painting. And we finished up the guest room just in time for my future (soon!) mother-in-law to come visit. This is also the home of most of my yarn stash, and now it sports a great chair for sitting and knitting in. While she was here, we visited a local yarn mill called Abundant Earth Fiber, where we enjoyed getting a full tour from Lydia which included Ben trying out her loom. Even though both his mom and I encouraged him, I am not sure he is going to make any of the rugs we will use when we put in the hardwood floors. Anyway… back to socks, and specifically Sock Madness. I did finish the pair with beads for the competition. I did it “Hollywood Style” which means they are too long in the toes (and I did run out of my skein there too!) so I shall just have to fix them in post-production. I solemnly swear to try to post my post-production sock fix. And then after the socks with cables and beads… it was Kilt hose to narrow the teams down to just seven. So I tackled my first pair of socks made intentionally for someone else. Which turned out better than I had hoped, and I have the distinct pleasure to present as worn with kilt. So this is the second to last round… and while I did get started, I’ve not gotten terribly far and will not be advancing to the final round. 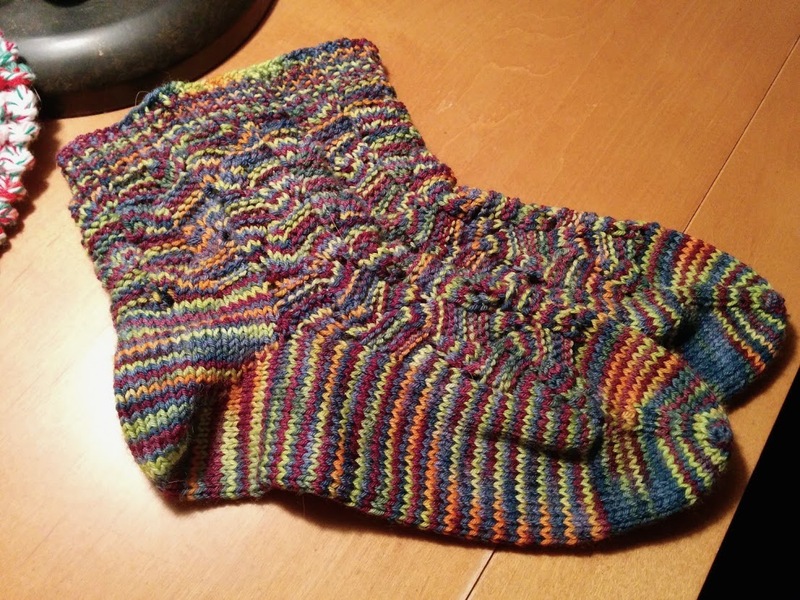 The pattern is by the same designer as the Semki socks I made, so its quite the challenge. While I didn’t make it all the way to the finals, I did win a prize! And all because I knit a very silly little flying pig between the rounds. As for the other things… well in addition to finishing my wedding shawl, I did actually tackle a shawl that I have had in my queue with yarn assigned from nearly 3 years ago. I know.. that’s a long time to have something in queue with the yarn, but let me take you back…. back to the early years. Like many a newer knitter, I started out trying to balance budget and skill, and you know me, I tend to be frugal. So it was a real splurge when I used some reward bucks at a yarn shop to pick out a gorgeous skein of Malabrigo lace. The color is called Archangel, but in my opinion, its the Orion Nebula. The pattern for this one is both simple and complex… mostly bare half-charts which leave some of the mechanics open to interpretation…. so I did my best. And before I forget yet again… I did enjoy the Yarn and Fabric Swaps. And quite frankly… I totally made out like a bandit! Here’s my fabric gift write up. My giftee posted a thanks, but no photos. So now I have more piggies, more wedding knits, and two pairs of color work socks to finish up… anyone have a knitting clone? Yes, that’s the same tabletop in both photos. Yes, I do sometimes fail with photography (hello lens shadow I see you!). 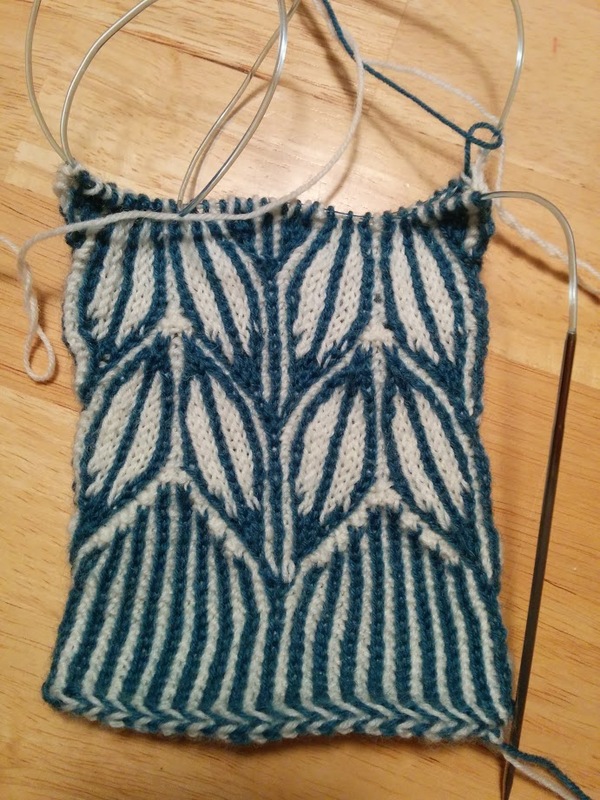 This pattern has 2688 beads and I knit it up on my salal dyed yarn. And since I’m rather pleased with it… here’s a ton more pictures. Believe it or not… I knit 1000 yards in January. (Yeah I know, I hardly believed it myself) The whole month I was in “I’m never going to finish all the things I want to get done this year” for a mindset which may have helped but then again was a bit stressful at times. 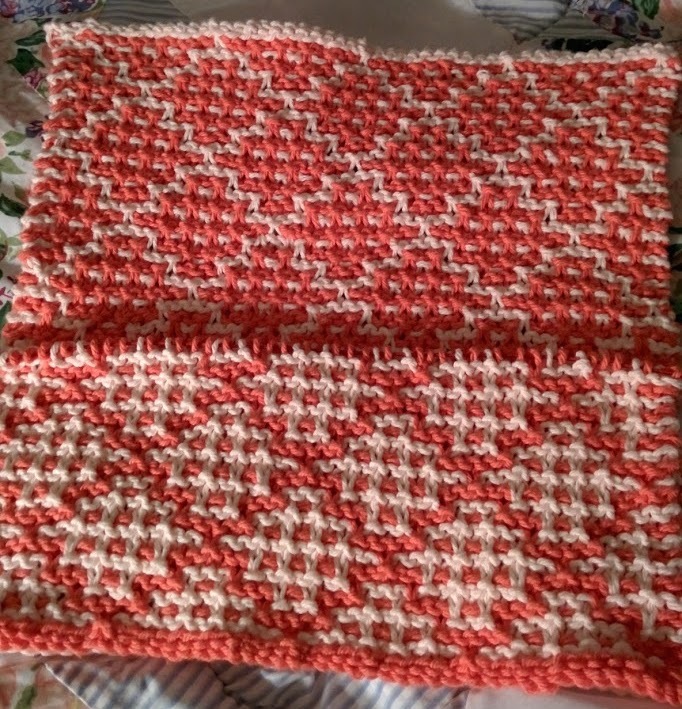 That pattern probably would look a bit better in a less variegated color, but it was a nice simple repeat suitable for taking in the car or when concentration isn’t as needed. Which means it offset my lace and beads shawl project. The pattern itself was only available for a very short time called Dance With Dragons. I used about half of my Secret Santa yarn, so I shall need to find another project for the remainder, but overall I am loving how it came out. Next up… it was the January Cold Sheep challenge… find the oldest yarn in your stash and knit it up. Technically I’ve other yarn that was in my stash for longer, but due to the time of year and the plans for it, I went with actually probably the oldest yarn. A vintage Dazzleaire from the era of when it was “new” that may even predate my own existence. This yarn joined my stash from another knitters stash. The idea of what to do with it went through several considerations and I really do like the colorway. 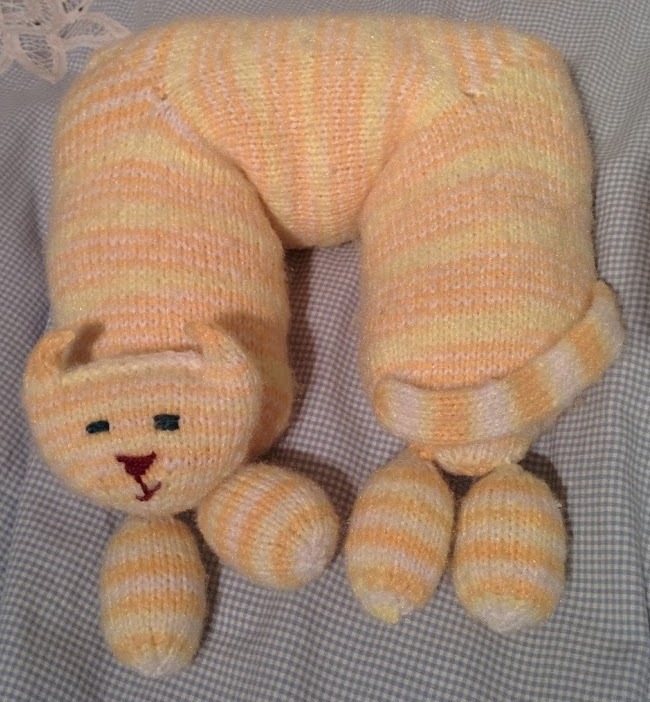 But when pressed for an idea… I decided to make my very own design Neck Cat. This dazzling kitty loves to travel. The essential design idea is a cat themed neck/travel pillow, and I’d say that while its comfortable, and obviously a cat, this fella needs a second go through the design phase. The next iteration I plan to aim for a more curved and less square body shape, with feet that are a part of the main pillow. Now at this point I was just shy of both February and 1000 yards. I wasn’t yet ready to start another beaded shawl. 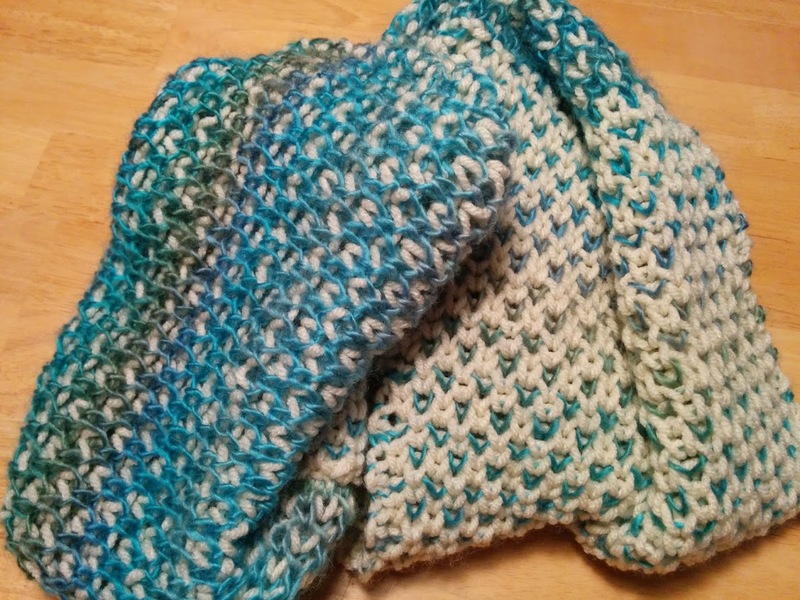 Another person shared some mosaic knit dish/wash cloths, and I am sitting on a stash of quite a bit of cotton so….I churned out a pair of cloths myself. Technically the photo above is at the one and a half cloth stage, but I thought it was a nice showcase of how you can just swap the two colors around and get a mismatched yet still matched pair. It successfully made two skeins of cotton exit the stash and so now I’m starting another mosaic pattern for another pair. Mosaic knitting is where you slip one color while working the other color across the design. When you get back to the start of the design, you swap and work the other color while slipping the first color. So what kinds of things have I got planned for 2015? Well aside from the painting inside the house projects… I do have some ideas for things more in line with my knit and quilt blog. First up… a confession. I have a lot of yarn. 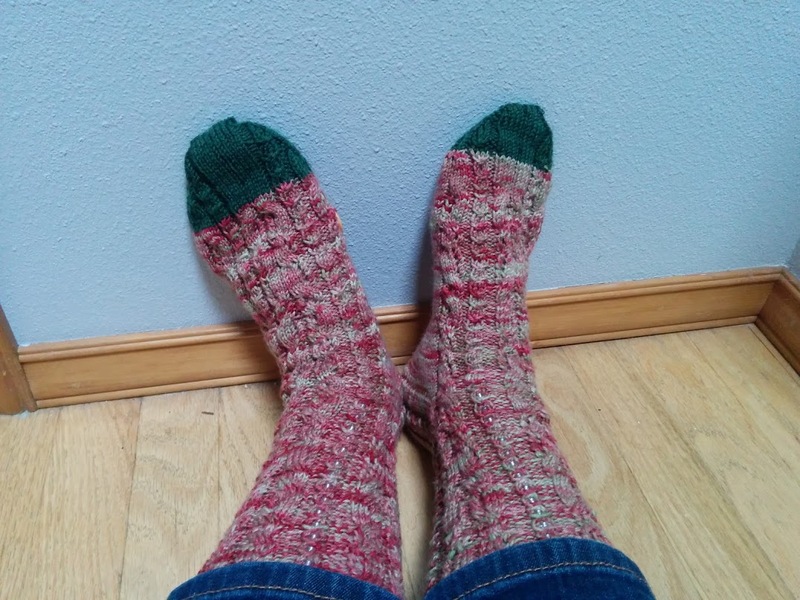 I knit over 5 miles last year… it was a drop in the proverbial bucket. This is my primary stash. This is my nicer yarn, stuff I really enjoy working with. The left side has a bin full of sock and lace weights, (which overflows into the bags you see on the floor in front when I’m honest and not just cramming them in on top -.-) and a bin full of plant based yarns (cottons and bamboo blends). The right two bins are both worsted weight. But wait! There’s more! 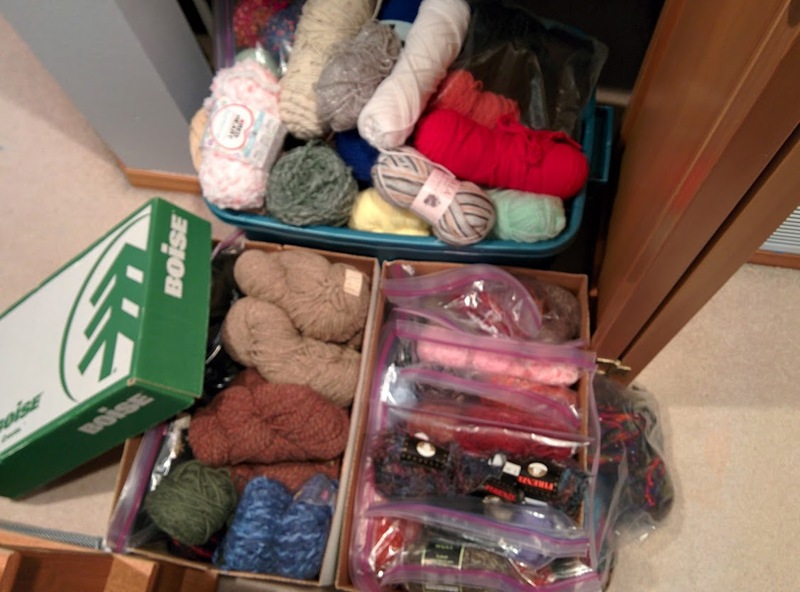 There is also a box of wool, and another box plus tote of acrylics hanging out in the closet. And that giant skein of cashmere lace in a project bag. So clearly my first order of business is to do a bit of a stash down. Working on nothing but “Cold Sheep” for the next 3 months, with options to renew. Cold Sheep is where you do not buy new yarn for a set period…. like cold turkey only for knitters. 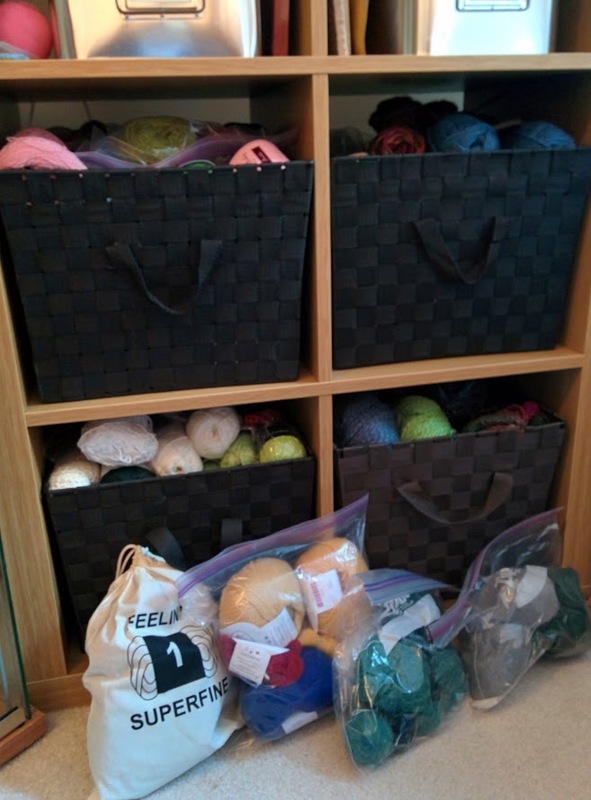 I’ve actually done a decent job of cataloguing my stash over on Ravelry (in case you want to see the particulars of what’s in the bins) and started to queue projects specifically to my stash. I have not yet found the perfect cardigan for one of the two sweater quantities of yarn, but do expect to see something cardigan with cables in the future. I am going to allow myself to buy notions such as beads and buttons, and patterns. 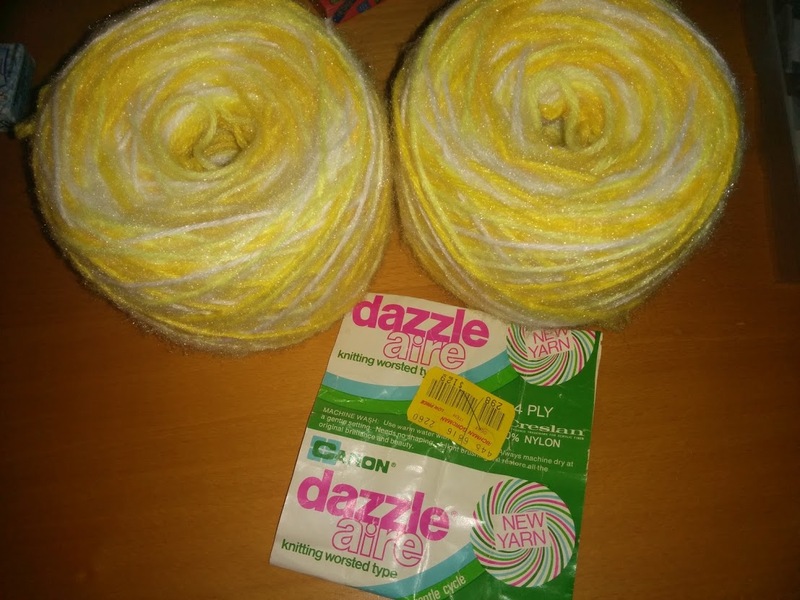 I will get a new skein every month from my Tipsy Sheep yarn club, but technically that was paid for in 2014 so its not really cheating…. right? I am going to knit up my salal dyed yarn this year, and I’m revisiting a designer who had the misfortune of being my first charted pattern, so I mucked it up pretty well, lets see if I’m ready to tackle a new chart and even more beads this time. 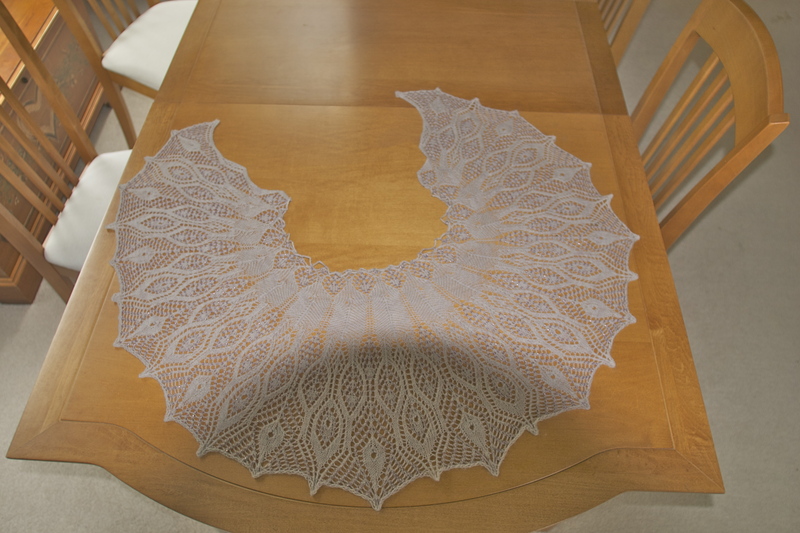 I am also planning a shawl for the gorgeous lace that my secret santa included as part of my gift. 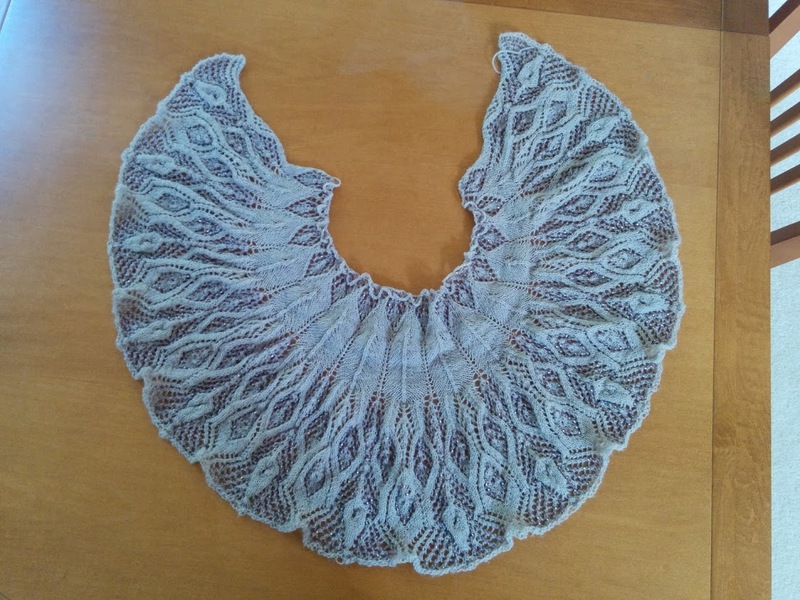 (You can see my thanks here) and there is still an outstanding Jay bird shawl… all three lace with beads. In addition to the sweater and lace with beads, I also have some socks planned. Starting with some yarn from the last round of yarn club, and proceeding through a pair of hanks in some colorwork socks! Which brings us to the quilting homefront. I absolutely, positively, beyond a shadow of any doubt, want to do the shop hop by bus again this year. That’s in June. I had so much fun in 2014, I am looking forward to it again. So I am definitely going to need to focus on my progress quilt bin so that I have room. Mario, Chess, and Star Trek are pretty decently along and just need a bit more finishing. Movies and Stars are progressing, but still in the early stages. Tesla and Embroidered Snowmen are not yet begun, although some of the materials have been purchased. That’s a total of seven quilts I am aiming for this year. Whew! That thinking about all the things I want to work on this year has me already a bit overwhelmed. Good thing they aren’t all due in February! There is just one last thing; I am planning to get some projects ready with no intended recipient. I am considering adding a page of finished objects that will be open for offers. I’m still hashing out the details but I will be sure to post when/if it comes to pass. In 2014, I knit at least 9320 yards, that’s over 5 miles of yarn! The last thing coming off my needles was a Checked Rose Stitch Cowl experiment, finished Dec 30th. This is a two color stitch worked with the same two yarns, just switching which yarn is the dominant yarn part way through. I did not knit up my alpaca yarn. I did manage some design work, but thus far I’ve not been happy enough with the results. I DID make my first gloves, followed by my first fingerless, and first TWO sets of mittens. I DID tackle my second socks, and the third pair, and even a fourth! While I didn’t work on the Stellar’s Jay shawl, I did start and finish 6 shawls this year. Four of the Six Quilts I was planning did get some work done, but I actually did not finish a single quilt. The only Quilting thing I finished were some pillow cases. I am still working on Mario! I totally tackled brioche stitch too! I published 2 new patterns and even dyed some yarn using local berries. So here’s a visual overview. Included you will find one rather fuzzy bear that was the secret gift I mentioned earlier. This was the surprise gift from last post! I tackled a milestone on the blog front too. There was exactly one day when this site was not visited by anyone, not even a robot. So I want to thank all of you (even the robots) for making me feel so awesome every morning. So now I be you are wondering what is next. I am going to save all that for a later post in the next few days, as this post is now very long and full of photos already. So I decided to refresh the site a bit as I head into year five. (Can’t believe I’ve been at this for so long.) So I hope everyone likes the blue, and if not then you can look forward to the next update in say… 4.75 years or so. In other news, when I visited my Grandmother this year she tried to explain how its hard to find a cute winter hat, perhaps one with flowers. So as a knitter…. I got right to work. The first one is a slouchy hat with a flower on the side, and I thought being kind of festive I’d use up some more blingy fluff and sparkle style yarn from my stash. 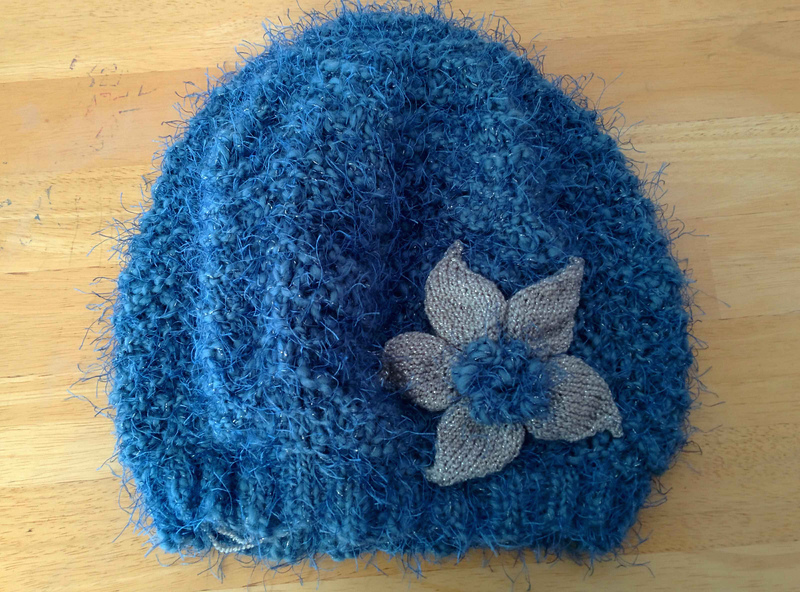 So back to square one on the hat front, but I am one of these people that seems to collect patterns around an idea, so naturally I didn’t have just ONE hat with flower(s) to choose from. So I picked another and some yarn and forged ahead. 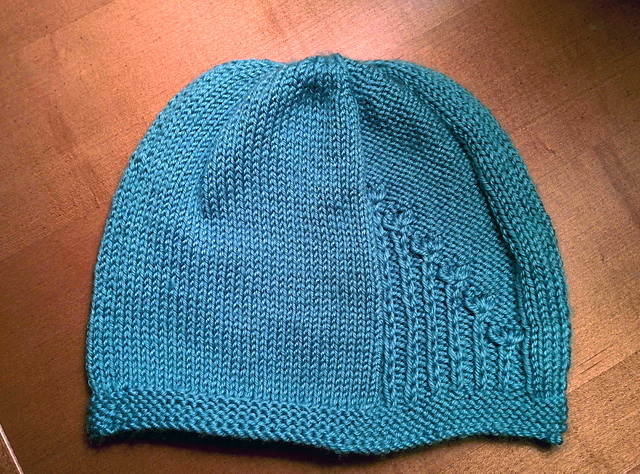 This pattern was super fast to knit and simple, yet a nice design. Hopefully its the hat with flowers type that she will enjoy and wear. In other knitted gifts, I made a colorwork shawl for another friend. The pattern is called Unalakleet. The actual drape is a bit of a capelet, and it is a real test of tension work as its done as stranded knit and purl. Which makes the backside appear to somewhat mirror the front, but is all done with loops of yarn carried across. There is just one more gift on my list I’m finishing up, but you and that giftee will just have to wait and see!